The commercial world is currently moving to greater levels of digitisation. Organisations are implementing automated and electronic solutions in an effort to improve efficiency and better the environmental footprint at the same time. The move to digitisation and electronic signatures prompted questions surrounding the legality of these documents. 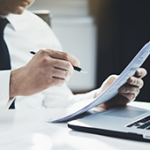 This article aims to highlight certain legal aspects of electronic signatures in both a general business environment and an audit industry environment. The Electronic Communications and Transactions Act, 25 of 2002 (ECTA) differentiates between standard electronic signatures and advanced electronic signatures. Standard electronic signatures include digital or scanned signatures. An example would be using an iPad to sign a document or merely printing, signing and scanning the document. Advanced electronic signatures are defined as electronic signatures which results from a process which has been accredited by the Authority as stipulated in Section 37 in the ECTA, for example, Quicklysign. the execution of a bill of exchange as defined in the Bills of Exchange Act, 34 of 1964. Stakeholders in the audit industry will be all too familiar with the challenges being posed by printing various sets of financial statements, only to be scanned again after signature. The industry seems to be one of those that will benefit from the efficiencies provided by electronic signatures but are these electronic signatures on a director’s and auditor’s report acceptable? the risk that the incorrect annual financial statements are published. We are of the opinion that an advanced electronic signature service provider, as approved by the ECTA, will sufficiently mitigate the above-mentioned challenges identified by IRBA. Contact us in order to obtain more information as to how we can assist in finalising documentation efficiently.